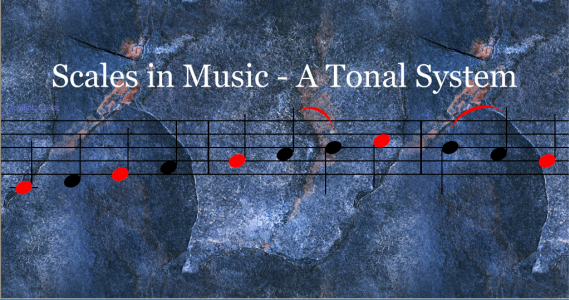 Welcome to Time Signatures – Part 22b in the ongoing music theory section of Scales in Music – A Tonal System overall article series. Time Signatures – Time signatures represent the time related structures and their respective instructions whereby note and rest patterns are placed within a specific rhythmically based sequence within a measure of music. They are simply, observable, repeated events which occur within the structure of time. The amount of actual time we need to consider is based upon the tempo (rate) or the speed in which the music is flowing through time. Please see Speed in Music – Tempo for more information about this concept. Time signatures play a different role in music composition than the role played by the tempo or speed as measurable by time itself. They do support the speed or flow of the music however they are the structure within a measure or series of measures which provides for the number of beats in a measure as well as what note or rest duration is needed to fill one complete beat within that measure or within a series of measures under the same time signature. We will be exploring this idea in this part 22b, as well as in Part 22c and Part 22d of the Time Signatures mini-series of articles. There are six related articles already published on this site which will support this article and its content. All six should be considered as prerequisite articles. They are; the independent articles – Basic Characteristics of Sound, The Musical Note, Speed in Music – Tempo and three articles within the Music Theory – Level 1 series – Note Identification –Part 11, The Musical Rest – Silence in Music –Part 12 and Dotted Notes and Rests – Part 13. All of the above named articles will provide support and additional information which will help you with understanding the content of Time Signatures – Part 22a, b, c and d should you need this additional information. Meter – The pattern in which a steady succession of rhythmic impulses is organized. One complete pattern is termed a measure or a bar of music. 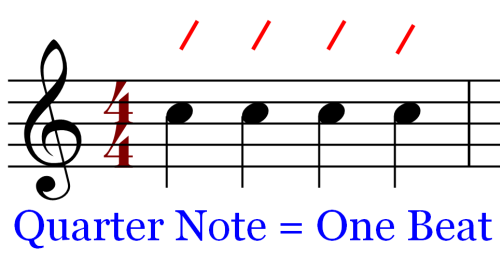 By this definition, the meter is not the measure itself but rather the pattern of notes within the measure. The concept of meter is relative to music in three very important ways. First, the pattern idea, which is developed from the notes and rests as used in music composition and written out using an acceptable system of musical notation. I term this system as the Symbolic Language of Music. The second is related to the word phrase “rhythmic impulses”. In the article Frequencies – Acoustics of Music – Part 3 we learned that sound is an undulating wave of compressing and decompressing air pressure, a pattern within one idea, the audible value or pitch of the sound. Now, we are taking that pattern and placing it sequentially along a linear path or on the musical staff and more specifically, within a single measure until the entire measure is fulfilled based upon the numeric designation as directed by the related time signature. We repeat that measure or add additional patterns within new measures in such a way that the end result sounds musical with a unique pattern or rhythm as established by the markings used to create the new music over a longer duration in subsequent measures. Sometimes the pattern remains the same and we use different notes and rests while at other times we alter or change the pattern to suit our needs as a composer. Think of it as a procession of a rhythmic pattern of multiple impulses or sonic events. This initiates our understanding of the third important way that our description for meter is applicable and influential in music composition. A “succession of rhythmic impulses” is a sequence or series of notes and/or rests within the measures of a composition where each measure, which includes its note and rest components, is followed by another measure, which in turn continues until the succession is changed, modified or it concludes at some point in time. In music, the conclusion is the finale or the final ending of the pattern of rhythmic impulses. Succession is perceived as a time based concept where one thing follows another until the pattern stops or is repeated. These three ideas, coupled with the definition and the directives from the Time Signature symbol, provides for us a clear understanding that music is indeed made up of finite or limited sets of systems and/or structures. For sound itself, these systems can be unlimited in size or further restricted to only that duration that fulfills other aspects within the systems related to music, such as a motif, phrase, section or a complete composition. These structures, measures in music, are strung together in a linear fashion, which begins and ends within a certain length of time. In music notation, music lives within time or duration in a linear fashion as one measure follows another. The really cool thing about music is that there are an infinite number of choices for the patterns one can use to create a new and totally unique pieces of audible art. Music notation is the idea and the system of writing out these infinite patterns of repeated note and rest values. Sonically, sound exists in the additional dimension of space as well. In Part 22a we reviewed the subject of time in general and the special relationship of notes to one another as well as throughout the composition. It is recommended to review this article as a reminder of the multi-dimensional characteristics of sound. Further presentations in reference to the spacial placement of sound will also be included in later articles, when discussing the spatial relationship of sound to a listener and when discussing music mastering where we place sounds in specific places within a space to gain the effect or localization of a performer against other players as well as the listener. What remains missing in this definition of meter is answered by this question, by what means is the rhythmic pattern defined? What we hope to convey to you in this article is an understanding of time signatures a composer has available for use when creating music, to gain the time related effect the composer is seeking. It is the beginning of understanding rhythm. Let us first start by reviewing Time Signatures and how they are constructed as well as what they mean. Time signatures are the symbols which represent certain time related ideas when it comes to the patterns described above. In essence, time signatures establish the basis of rhythm itself. It establishes how many beats to a measure and what note value receives one beat. When you think about it, time signatures act somewhat like a limiter or restricting device. In this way they also provide the basis for defining the limitations a composer is confined to when creating new music. Sometimes limitations are a good thing. This is one of those times, no pun intended. The symbols for time signatures are presented using either an alphabetic letter such as C for common time or what appears as a fractional-like number to demonstrate them. If you will recall from your math classes, fractional numbers are made up of two separate numbers stacked on top of one another or written out linearly to look like this, 4/4. The line separating the two numbers denotes an actual fraction as is typically seen in mathematics. Let’s look a little closer at this fractional number as it is related to music. Time Signature Placement – The chart above shows the fractional numeric form of the symbol for time signatures. In this example, the 4/4 time signature is shown in dark brown. The placement of the symbol is to the right of the clef symbol and it rests between the top and bottom lines of the five-line musical staff. There is no short line separating the two numbers in the musical time signature as they are simply stacked one upon the other. The middle line of the staff lines does fall in between the two numbers of the time signature however this is quite different than the short line used in mathematics to denote division. The Top Number – In mathematics, the fractional number of 4/4 the first or top 4 is called the numerator*. In mathematics, the top number provides a designated value for the number of divisions of the bottom number. However, in the case of music, the top number is a value that represents the number of allowable divisions within a single measure of music and it is not a division of the bottom number. 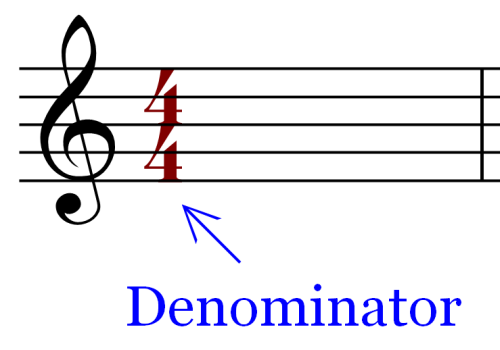 This distinction is important in music in so far as it determines and limits the number of divisions that may occur in a single measure by its actual numeric value, in this case 4, when used in the time signature for a piece of music. 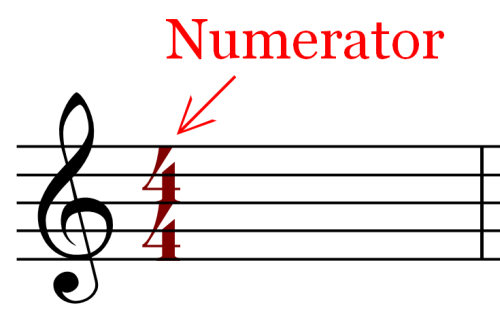 *Reference – The term numerator is also used to designate the top number of the time signature, therefore it is important to understand how the term is being used whether used in mathematics or in music. For more information and for proper usage please see these two references for clarity – Music Notation, A manual of Modern Practice; Gardner Reed, page 149. The Harvard Dictionary of Music, Fourth Edition; page 507. The second chart shows these divisions using red colored hash marks above the staff. Each division is called a beat. Each beat within a measure is of the exact same duration as the other beats within the same measure. Subsequent measures may contain the same number of beats or they can be modified by using a different time signature to suit the flow of the composition or to change the flow such as in the case of adding another time signature variation to the main theme of the musical work. Also, each beat’s actual clock time duration is directly tied to the tempo as designated in the music. Please see Speed in Music – Tempo for more detailed information on the effect of tempo on the actual clock time duration of a beat. The top number of the musical time signature designates the number of beats within a single measure of music. The divisions themselves are not the note and rest values rather they are the number or quantity of beats in a single measure. The Bottom Number – In music, the bottom number of the time signature designates which note shape gets one beat. The bottom number is also a division in a different way. 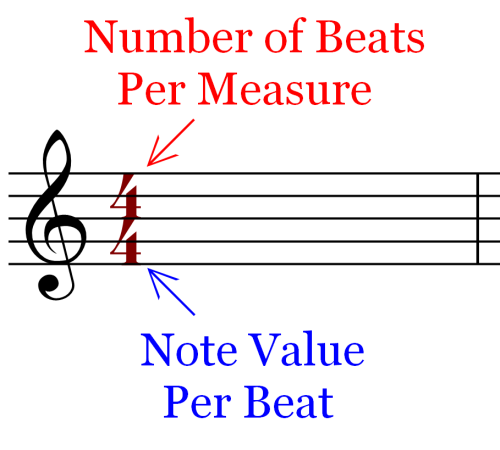 It is not of the measure itself as the top number is related to, but rather, it designates which note value gets one beat within a measure of music. The note symbol and its related duration, based upon their shape or value (i.e. 1 for whole note, 2 for half note, 4 for quarter note, 8 for eighth note, 16 for the sixteenth note, etc.) is identified using this bottom number. Succinctly stated, it designates which note value gets one beat. The distinction between the mathematical equation or fraction, wherein the bottom number of a fraction is also called the denominator*. In math, the bottom number divides into the top number creating a decimal equivalent of the equation. With this in mind it is easy to see that the fractional number in music is very much different than that used in mathematics. *Reference – The term denominator is also used to designate the bottom number of the time signature, therefore it is important to understand how the term is being used whether used in mathematics or in music. For more information and for proper usage please see these two references for clarity – Music Notation, A manual of Modern Practice; Gardner Reed, page 149. The Harvard Dictionary of Music, Fourth Edition; page 507. 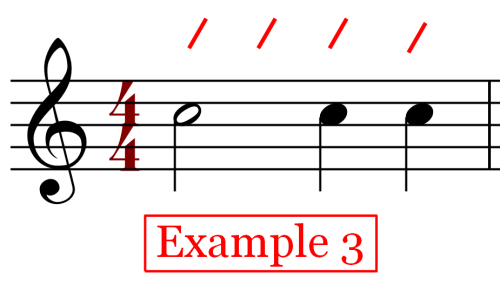 In the chart above, the 4/4 time signature instructs us to use four beats in each measure as designated by the top number 4 as demonstrated by the four red hash marks. The bottom number tells us that a quarter note gets one beat. 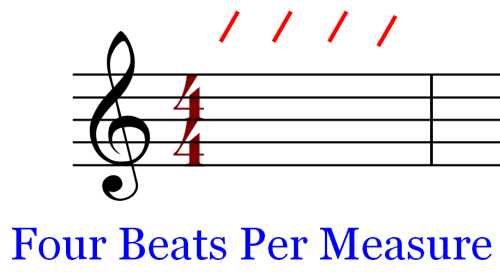 Consequently, the chart above shows both the number of beats per measure of music, the red colored hash marks, as well as the use of the quarter note and it’s duration as designated by the bottom number of the time signature symbol. The bottom number tells us that the basis value or note value in the time signature is specifically designated by its actual stated numeric value, in this case, 4 which is represented by a quarter note. Secondly, take note that the red hash marks are placed directly over each beat and each quarter note falls on the beat. The bottom number of the Time Signature symbol instructs us as to what note value (duration base on note shape) gets one beat in music. So far so good! Now let us see what happens when we begin to introduce some variations into the 4/4 time signature without altering the tempo. The next five examples will demonstrate at least one variation for note or rest values still within the 4/4 time signature where the note or rest falls on the beat. 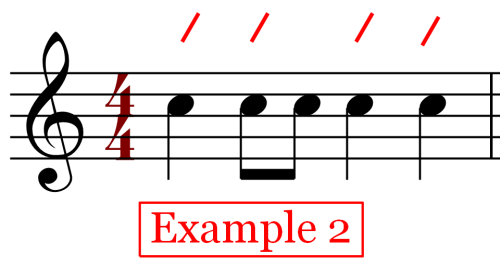 Example 1 – A quarter note is equivalent to a quarter rest which makes a direct option available to choose either one for any single beat. In this example we have chosen to place a quarter rest on beats two and four and quarter notes on beats one and three. The total measure duration remains the same as if all beats had quarter notes or all were quarter rests. Each beat is accounted for by either a rest or a note. All beats must be accounted for. Example 2 – In this example, on the second beat we have placed an eighth note directly on the beat and an eighth note half way between the second beat and the third beat. Since two eighth notes are equivalent to a quarter note we meet the beat requirements for beat two. For beats one, three and four we have placed a quarter for each beat. Again for this example, the total duration of the measure remains the same and all beats are fully accounted for. 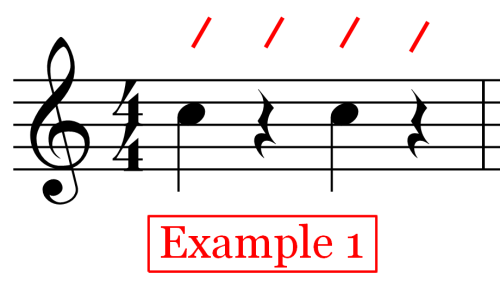 Example 3 – In example 3 rather than using four quarter notes, one on each beat, we have placed a half note on beat one. A half note is equivalent to two quarter notes so the duration is the same for beat one and beat two as if we placed a quarter note on each beat instead, we simply hold the note for the duration of these two beats. We do not place any note or rest on the second beat because the required duration of two beats is fulfilled by the half note. The remaining two quarter notes gives us the total of four beats completing the requirements for the measure. Example 4 – Things can get a little complicated when you consider all of the note and rest value options a composer has available, some are included in this example. We are still required to meet the four beat requirement for each measure under the 4/4 time signature. Here we have placed a quarter note fulfilling the first beat requirement. For beat number two we have split the beat into parts by placing a sixteenth note, followed by a sixteenth rest and completing the second beat requirement by placing the eighth rest, again filling up the beat. Beat three is fulfilled by another quarter note. Beat four has an eighth note falling on the beat followed by an eighth rest filling up the final beat in the measure. Example 5 – This example extends the idea used in example 4 by demonstrating that you can select any number of note and/or rest values within a measure as long as the total duration meats both the beat count requirement and that each beat is equivalent to the duration of a quarter note. For beat number two above, we have place a sixteenth note directly on the beat. A sixteenth rest follows which fulfills only an eighth note value leaving another eighth note or its equivalent to fill up the last half of the beat requirement. To do so we placed four thirty-second notes on the last half of the second beat. These four thirty-second notes are equivalent to one eighth note in duration. Consequently, the first half and the second half of the beat requirement are fulfilled when taking into account all of the note and rest values on beat number two. Beats one, three and four are filled using a quarter note. All beat requirements are met in this example. In brief and without the philosophical environment, the time signature is the excepted way for determining how many beats in a measure and which note value gets the duration value of one beat. 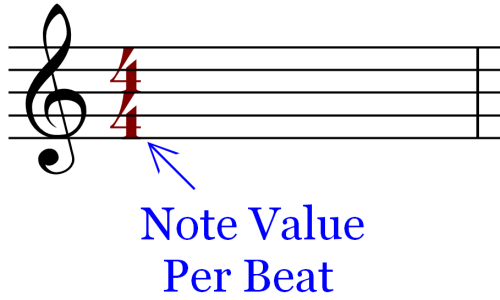 All beats within a measure are required to be filled with either a note value or a rest value equivalent to the remaining duration of the beat or beats which may remain to be fulled while writing the music. 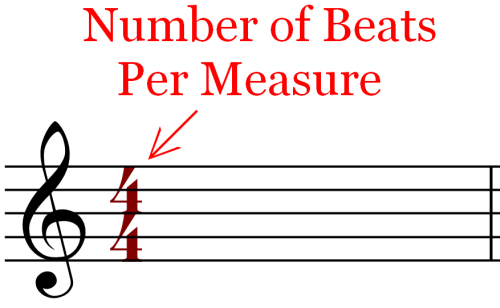 1) The top number is the number of beats in a measure. 2) The bottom number is the note duration that gets the equivalent value of one beat. 3) Time signature symbols are placed after the clef in the beginning of the composition or at any time within the composition if a time signature change is necessary. 4) Time signatures are only one part of the idea behind rhythm. Tempo, note and rest placements also play a role in rhythm. 5) Any number of notes and/or rests can be placed within the duration of one beat. The key is to count the note or rest values and match that to the requirements for each beat as designated in the lower number of the time signature. I will be happy if you understand these five points at this time. If needed, please take a moment to review the prerequisite articles relative to your specific needs. If you feel you understand this information then great please move on to the next article. If you are not comfortable or if you are feeling confused then great, you’re learning something! Please review the referenced articles and take it a bit more slowly. You will pick up the needed understanding with your review. We have only touched the surface for note and rest placement as related to the various beat patterns used in music. There are countless examples which could be used and we hope this presentation will at least open the door for your understanding of time signatures. This concludes Time Signatures – Part 22b. Although it takes a little practice, you can become comfortable with time signatures. The note and rest values are vitally important to gain understanding of time signatures and their use. This takes us to our next article in this mini-series on time signatures. In this part of the mini-series we discussed and demonstrated the 4/4 time signature. In Part 22c we will look at several more time signatures which are used regularly in music. Scales in Music – A Tonal System – Music Theory Section – Level 2 – Time Signatures – Part 22c continues with a review of Common Time, Cut Time, 3/8, 6/8, a range of additional time signatures and a lead in to Time Signatures – Part 22d applying the information about time signatures. Please proceed to Time Signatures – Part 22c. Note: All charts were produced in Sibelius Notation Software a product from Avid Technologies. Nice article! Thank you for the reference and link to my website and the specific article on time signatures. Secondly, the graphic is my design and layout as well. Please give credit for the graphic in your article just below the graphic as; Graphic Design by Don Rath Jr. I will approve this use of my work under the condition that the credit statement is added, otherwise I will kindly ask that it be removed from your article should you not place the credit statement in your article.